Mobile app available in the App Store for iPhone and iPad. Track and monitor the age of your food product from fresh to finished. Easily configured for your products with built in alerts. Designed to let owners and managers know the status of every product at any time. For use in single and multiple concept locations. Setting up your stores can be done entirely inside the App, or use your favorite spreadsheet for larger setups. Product detail, shelf life, product states and employees are all able to be entered in a spreadsheet and then imported into Spoiler Alert from either iCloud or DropBox. There are also industry standard products built in to get you started. 2. Edit a spreadsheet application to your store's requirements. 3. Save it as a column separated value (.CSV) format. Each store purchases a subscription to Spoiler Alert. Then those labels can be shared as much as you like. 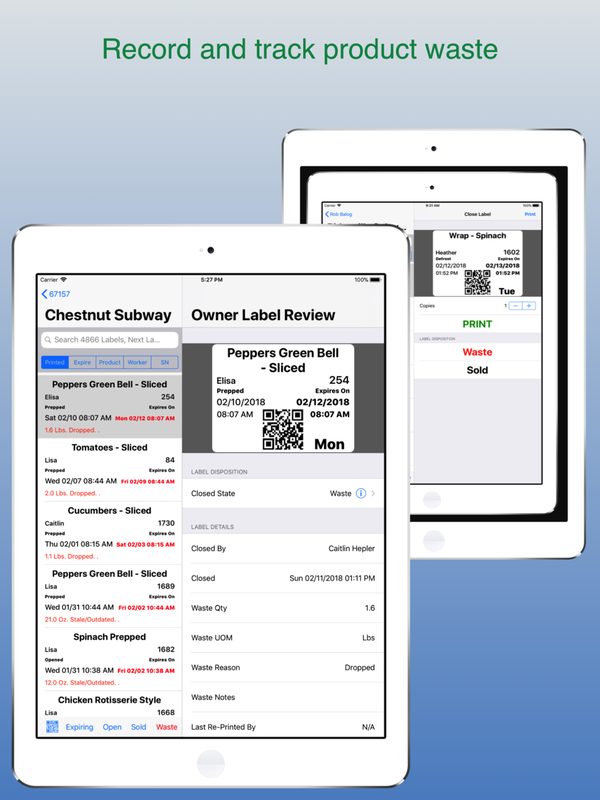 Share from each store to yourself to consolidate many stores onto your iOS devices. 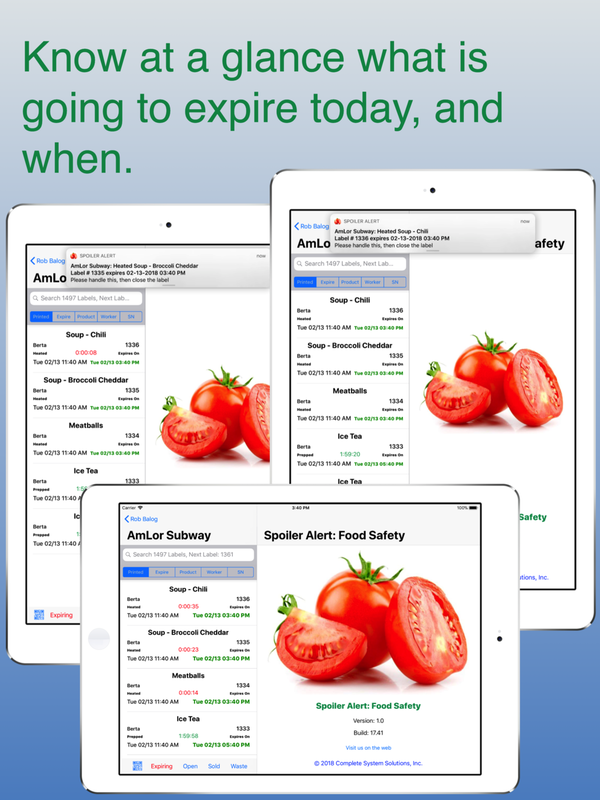 Share with managers or shift leads to keep a close eye on expiring product and act upon it in a timely manner. Tap the diagram to the left to see an example. Need to update a product? Is a shelf life entered incorrectly? Was a product recorded as waste? Any changes to your stores labels are updated on every device automatically. You'll always have up to date knowledge of the status of your product. Tap the diagram to the right to see an example. Each employee is assigned a PIN. This is used to log who last handled your product. Employees have a limit set of abilities. They can for instance print new product labels, re-print damaged product labels, print pre-defined static text labels and review, search and reprint existing labels. Each action is logged and visible by the owner. Owners have a password to a store that allows for customization, product and employee maintenance, export of label logs and detailed auditing of activity. The password prevents employees from changing store settings or updating products. Below is a complete list of abilities. If you allow notifications, Spoiler Alert will send you an alert as product expires. Regardless of where you are! This means your watch, iPhone, iPad all receive the notification. You know immediately if you have product that has expired and required handling. Each label contains a QR code when it is printed. When the time comes to close the label and mark it as sold or wasted, you simply scan the QR code to bring up that label. In fact there is a mode to scan a series of labels marking each one as sold as they are scanned - no tapping required! When each label is closed, it can be marked as sold or wasted. If product is wasted, Spoiler Alert will track the waste quantity and reason for you. This information can later be exported to a spreadsheet for long term records.